Want a twist on the traditional dice game of Yahtzee? Give Yahtzee Turbo a try! Players first turn a card over and begin rolling the dice like crazy trying to match the pattern on the card. There is a fun twist as the speed detecting die adjusts to your speed! In Yahtzee Turbo, it is a race to discard all your cards. Yahtzee turbo can even be played alone with one to four players. So get rolling and roll fast in Yahtzee Turbo. Be the first player to discard all the cards in your hand. 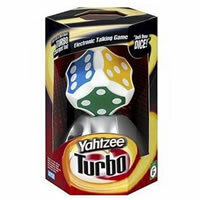 Yahtzee Turbo includes the electronic Yahtzee Turbo game unit and storage base, 5 multi-colored dice, deck of 48 cards and the Yahtzee Turbo game rules and instructions. Please keep in mind that the official Yahtzee Turbo dice-card rules and instructions could be different depending on the game version you have. The rules below are some of the exact directions on how to play Yahtzee Turbo. Share with us your comments, funny stories, tips, advice, strategies, creative ways to play, questions about how to play, problems with the rules or anything you want about Yahtzee Turbo. All submissions will be reviewed within 24 hours. Click here to add your Yahtzee Turbo comments. I gave this as a gift for Christmas last year to my mother in law who is obsessed with Yahtzee. She loves it. She likes that it is a little more fast paced than the original. The rules are pretty similar but enough different that it makes it fun.